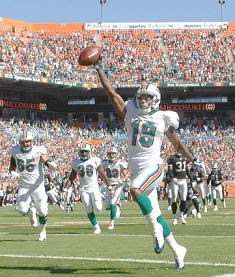 The fins beat the Oakland Raiders 17-15 this afternoon. That puts Miami at 6-4 for the 2008 season. Pretty incredible after the 1-15 debacle of last year. I’m still a skeptic about the rest of the 08 season. Miami has won the last two weeks by a combined total of four points against two teams who are a combined 4-15. Both wins came at home too. What will happen when Miami plays a real team for a change. New England comes to town next Sunday. Miami clobbered them 38-13 less than two months ago using what was called ‘the wildcat offense’. The Patriots will be prepared for the gimmick this time. Can Miami sweep New England for the first time in ages? After New England, Miami has games left with 7-3 NY Jets, 5-4 Buffalo, and St. Louis, San Francisco and Kansas City who won’t bother looking up the records for, but I know are all doing poorly this season. Miami could go 12-4 but I doubt it. I’m betting 10-6 or 9-7. Miami loses to New England, loses a game to either Buffalo ro the Jets, and possibly gets upset by one of the three remaining bums. *- Miami stopped the Oakland running attack this year. Oakland gained 299 vs. Miami in 2007 but only 70 today. *- Ted Ginn may be coming into his own. He scored a touchdown on a 40-yard reverse play in the first quarter. Later in the game he made a key grab on a 4th and 5 play. *- Jamarcus Russell looks to me as if he has the makings of an NFL QB. Too bad he plays for a terrible team. *- The Miami running game was on today. Over 100 yards from Ronnie Brown, 222 yards total as a team.